RUSH: We’ve got some clarification from Mnuchin. Yes, it was quick. 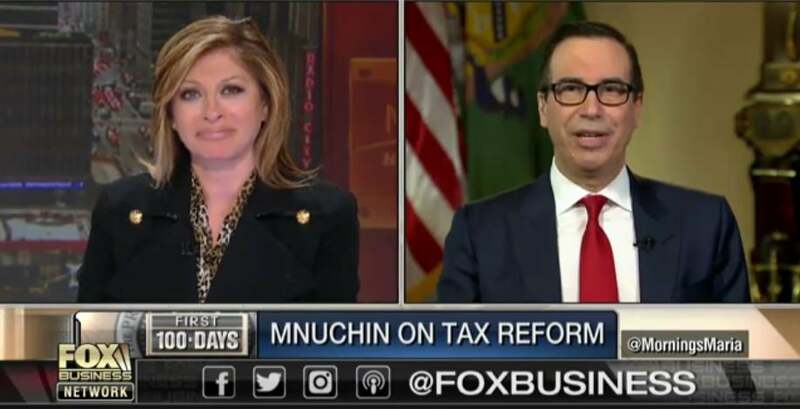 Mnuchin says that he hopes to have the tax plan passed by August, not formulated. (interrupting) What do you mean? Are you being sarcastic in there? All right. Okay. (interruption) Well, that’s when Reagan got his signed was in August. That’s a big difference than having the plan ready to go by August and having it signed into law by August. Those are very different things, so that’s good. Scott Baio, if you’re still out there, I have an idea that something’s up. You know, Trump’s addressing a joint session of Congress on Tuesday. It is the quasi-State of the Union show, even though Trump, it’s his first term, not a State of the Union. It’s that time slot, it is that scheduled speech within Trump’s addressing next Tuesday at joints session. And I wouldn’t be surprised if that is where Trump, when addressing the nation, starts telling Congress what he wants and what he’s expecting and, therefore, what the American people voted for. Whether Trump calls out people by name in that circumstance, I don’t know. But I doubt that Trump will let that opportunity go by without using it to light a fire under those on Capitol Hill. Because, as we just pointed out, they’re not naive and blind up there. If they sense that there is an active effort or agenda to stop the Trump agenda from being implemented, they know it. In the White House, they would have full knowledge of this. They would know more about it than we would. They would know where it comes from; they would know what’s behind it; they would know why. For example, are they up against donors to these members of Congress, ideological or what have you. The one thing that stands in the way of tax cuts… Now, folks, you may laugh about this. I’m not trying to be funny, but you take a look this nation’s budgets the last eight years, and they grew and they grew and they grew and the sad fact is the Republican Party gave Obama what he wanted. That’s how he looked at it. So these guys love spending. The Republican side, too. We haven’t seen any budget restraint from the Republicans, frustratingly so. Isn’t that true? So you start talking tax cuts. Well, what does Washington think? “Well, if you’re gonna cut taxes, you gotta have some spending cuts. You can’t…” This is where we differ. They have this notion that Washington budgetary operations are a zero-sum game, that if you cut taxes by a dollar, that you somehow have to reduce spending by a dollar. And if you increase spending by a dollar, you gotta raise taxes by a dollar. They look at this as a zero-sum game, and it’s a crock. Everybody knows that targeted tax cuts are going to expand revenue coming into Washington by creating more taxpayers, by creating more jobs, and by creating more government growth — and it’s been proven countless times. Our tax rates have crept back up to where there’s room to have marginal rate cuts. We’re back up to 39% on the top end. Now, I’ve talked to the chairman of the Ways and Means Committee, Kevin Brady, and he’s got a plan, and his plan calls for a top marginal rate of 33%, and that probably is pretty much the Republican plan: 33% marginal, three rates. (sigh) Well, now that I say that, I don’t want to attach that totally to Kevin Brady. But I have talked with him about it, and I know that there’s room to cut taxes that will cause economic growth. And at some point… You know, you get tax rates down to 20% and you cut ’em further, you can’t automatically conclude it’s gonna create growth. It could, but you reach a point of equilibrium. But we after the Reagan tax cuts which took the top marginal rate to 28% in 1986. We’ve crept back up to 39%, but the deductions have not been re-implemented. So there’s plenty of room for rate cuts, marginal rates cuts. And the idea that the government can’t do with less? See, we’re thinking we’ve elected people who don’t think that. “We’ve elected Republicans. We’ve elected conservatives. They realize government’s too big. They want to join us in reducing the size of government for all kinds of reasons!” But that, apparently, isn’t the case. Trump knows this. Look, Trump knows he’s going to have to make the trains run on time. Trump knows he’s going to have to implement his agenda. And the going on this is gonna be rough at first. But if he succeeds and his agenda ends up impacting the nation overwhelmingly positively, then converts will come along, ’cause everybody’s gonna want to be in the glow of success. But he’s gotta get past — and this illustration of Obama repeal laws: Six of them were actually sent up to Obama with full knowledge that he would veto them, and there haven’t been any sent up to Trump yet. Brief time-out. Much more straight ahead here on the EIB Network after this.